Franciscans in sixteenth-century New Spain were deeply ambivalent about their mission work. Fray Juan de ZumÃ¡rraga, the first archbishop of Mexico, begged the king to find someone else to do his job so that he could go home. Fray Juan de Ribas, one of the original twelve 'apostles of Mexico' and a founding pillar of the church in New Spain, later fled with eleven other friars into the wilderness to escape the demands of building that church. Fray JerÃ³nimo de Mendieta, having returned from an important preaching tour in New Spain, wrote to his superior that he did not want to enlist again, and that the only way he would return to the mission field was if God dragged him by the hair. This discontent was widespread, grew stronger with time, and carried important consequences for the friars' interactions with indigenous peoples, their Catholic co-laborers, and colonial society at large. This book examines that discontent and seeks to explain why the exhilaration of joining such a 'glorious' enterprise so often gave way to grinding discontent. The core argument is that, despite St. Francis's own longing to do mission work, his followers in New Spain found that effective evangelization in a frontier context was fundamentally incompatible with their core spirituality. Bringing together two streams of historiography that have rarely overlapped - spirituality and missions - this book marks a strong contribution to the history of spirituality in both Latin America and Europe, as well as to the growing fields of transatlantic and world history. 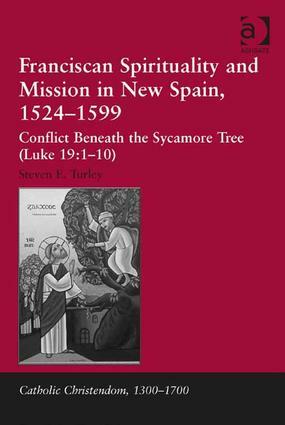 Contents: Introduction; Medieval precedents of missionary spirituality, 1209-1523; The eremitic ideal of the mission pioneers, 1524-1548; The difficult reality of the mission practitioners, 1524-1548; Flight and fight in the missionary Church, 1549-1574; Eremitic retreat and a new missiology in the Church, 1549-1574; Crisis and renewal in the maturing Church, 1574-1599; Peninsular repercussions of the mission enterprise; Conclusions; Bibliography; Index. Steven E. Turley has served as a lecturer in History at Rice University and as an adjunct assistant professor of History at Fuller Theological Seminary - Texas. He is currently a graduate and faculty chaplain at Rice University. His next research project will extend the analysis of the present book, to examine the ways in which Franciscan mission work and spirituality continued to interact and evolve as they moved into the northern territories of Mexico.